Gone are the days when Trivandrum beach tour used to be about Kovalam beach holidays and Shanghumugham evenings. Both these beaches are busy even today. What has changed is that many new beaches have come to the spot light. From Trivandrum city (Tvm for short, Thiruvananthapuram, if you want it unadulterated), travel 16 kms south and Kovalam welcomes you with three sandy beaches, shallow bays and coconut groves. Kovalam, the most famous and the busiest beach of Kerala, is also one of the best for mainstream beach holidays. Swim, snorkel, surf or ride the waters in a tiny fishing canoe, choices are many. From beach side ayurveda to night bonfires, there is more to do in the shore as well. Travel a couple of kms south from Kovalam, and you are in Vizhinjam, a fishing hamlet with a natural harbour. Not too far is a nice beach, usually with very few people. Travel further south and you reach Somatheeram, the beach famous for ayurveda holidays. The road distance from Vizhinjam to Somatheeram is about 10 kms. The road takes a lengthy detour. The actual distance is much less. Somatheeram area has several auyrvedic resorts, where you could holiday in style while receiving daily medical treatments. While Ayurveda addresses a wide range of health issues, a big chunk of tourists opt for rejuvenation therapies which include massages, oil baths etc. Somatheeram is about 23 kms south of Trivandrum city. The final stop in our southward travel is Poovar. Located about 7 kms away from Somathheram, Poovar is a beach – island. It is actually an isolated island holiday destination which happens to have a couple of beaches. 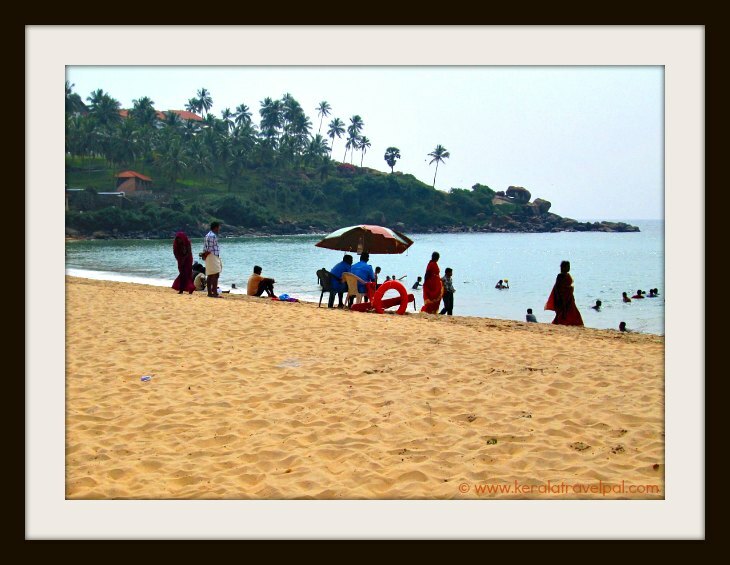 These two beaches are – Poovar north and south. One of the beaches is a sandbank separated by backwaters on the east and ocean on the west. Poovar can be reached from Trivandrum in about 40 minutes by car. The distance is about 27 kms. This city beach is good for evening walks and watching the sun set. It is a no zone for swimming though. Just a stroll away is Veli, the tourist village, where boats are rented for lake rides. Veli is a small stretch of land between backwater and the sea. Shanghumugham beach is just on the outskirts of Trivandrum city, adjacent to the airport. Varkala is one of the best beaches in Kerala. To reach there you have to travel north, about 54 kms from Tvm city. In Varkala, a long cliff runs next to the beach. The cliff top, a great look out, has restaurants, cafes and artifact shops all over it. 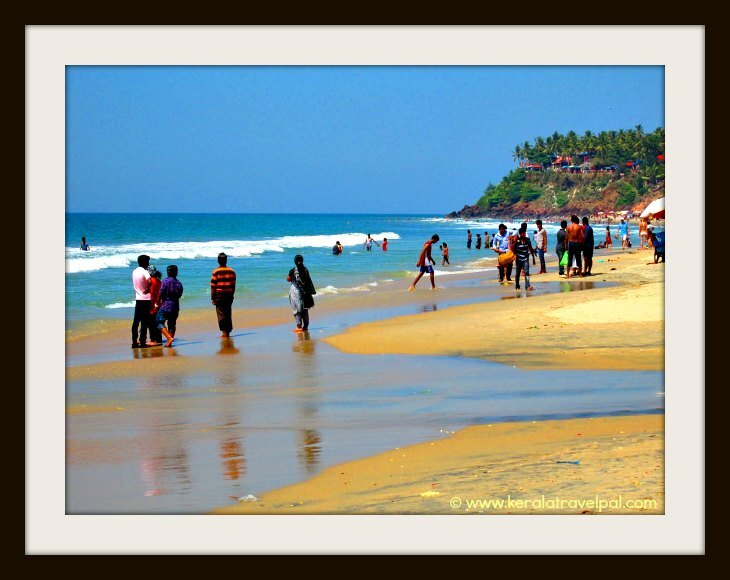 Varkala is one of the top spots to include in Trivandrum beach tour. Janardhana Swamy temple on the cliff top is a prominent Hindu shrine. Kappil backwaters and Sivagiri mutt are other two regional attractions. Kappil is a stunning location where backwater and ocean occupy either side of the road. Kappil is a great place for backwater rides. The beach is small and with not many people around. There are similar small local beaches in the nearby villages of Edathua and Odayam. If you want a remote beach, quiet and nice, try Odayam, a few kms north of Varkala.